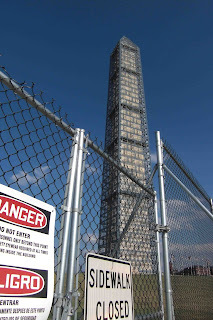 At the Washington Monument, flags still circle the base, flapping in the breeze, but a fence emblazoned with Danger signs surrounds the monument. Danger? Will the obelisk fall over any minute? Do people get on the elevators and then disappear into another dimension? Is there a moat of quicksand or a field of angry gerbils? 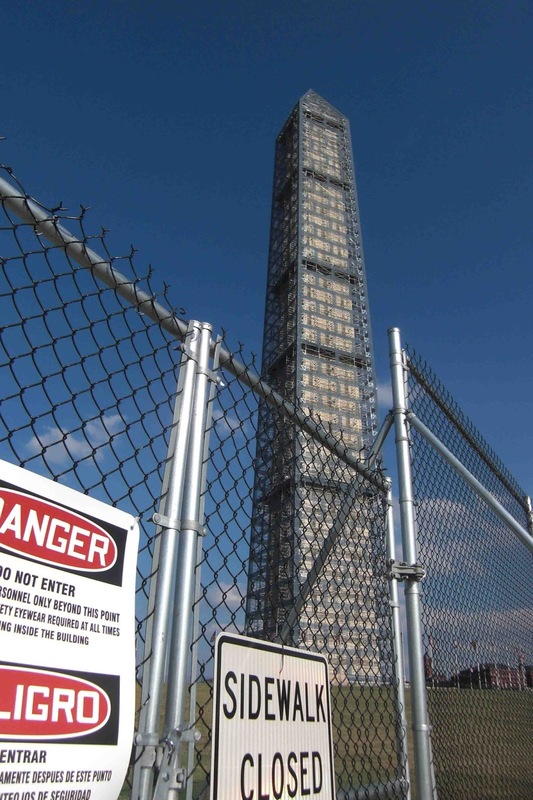 No, it was the 2011 earthquake that closed the Washington Monument. Philanthropist David Rubenstein stepped forward to pay for the repairs. It is now wearing a familiar scaffolding, designed by architect Michael Graves and used in 1999 and 2000 for a long-scheduled renovation. There is a utilitarian beauty in the scaffolding's stone-like grid. It casts shadows and seems to change color as the day progresses. We can enjoy this until the Danger signs come down.